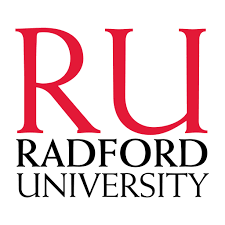 Radford University is a comprehensive, midsize public university that is student-focused, providing its more than 9,900 students a diversity of outstanding academic programs. Well known for its strong faculty/student bonds, innovative use of technology in the learning environment and vibrant student life on a beautiful campus, Radford University offers many opportunities to get involved and succeed in and out of the classroom.Radford University welcomes students from the Commonwealth of Virginia, across the country and around the world. Here, you will find inspiration in the surroundings �� the manicured green lawns on campus, the steady roll of the New River, the wonders along the Blue Ridge Parkway, the stately university buildings and a quaint downtown. Radford̠s more than 150 undergraduate and graduate programs offer every student the opportunity to discover new talents, develop leadership skills and experience personal growth.